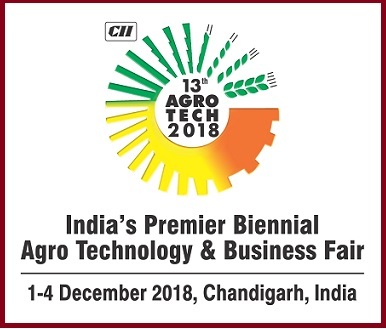 The 13th edition of the CII Agro Tech India-2018, the biennial agro technology, and business fair kicked off on 1st December 20a8 in Chandigarh. It was inaugurated by President Ram Nath Kovind. The CII Agro Tech India-2018 is a four-day event which was organised by Confederation of Indian Industries (CII). It was scheduled to take place from 1st Dec to 4th Dec 2018. The CII Agro Tech India-2018 witnessed the participation of 195 exhibitors, which included 37 foreign exhibitors from 8 countries like China, USA, UK, Canada, Germany, Italy, Netherlands and Spain are taking part in the fair”. It must be noted that the UK is partner country at the CII Agro Tech 2018. The CII Agro Tech India-2018 theme for this year is 'Technology in Agriculture: Increasing Farmer's Income. In the fair, the partner country is Great Britain while focus countries are Canada and China. The CII Agro Tech India was first started in the year 1994.